Sandra Kaye: My New Studio is Done!! Hello Lovely Blogger's!!!! I hope each and everyone is having a smashing Monday?!! I have finally finished my new room! I am such a HAPPY CAMPER!!!!! And so is my daughter. With the room switch in our house we both got bigger rooms. She can have a social pow-wow in her room now. And so can I !! I love to have artsy friends over to play art together, and my last space didn't allow that very well. Now, I have room to share!!! (which makes me HAPPY :):) This room switch has taken all my time for the last week and a half. I wanted to get it done as fast as possible so I could get back to making ART. ..........................Drum roll please!!!!! Here is my new room! I am standing at the door into the room. I love the double glass door it let's in so much light. I really needed several spaces to work, I don't just quilt. I absolutely LOVE mixed media stuff as well. 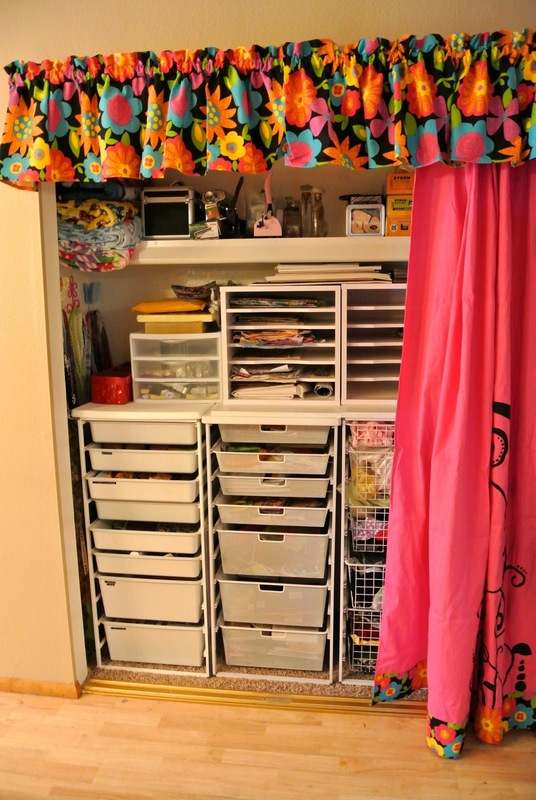 I really wanted a place I could spread out paints and glues without getting mixed in with my sewing machine and fabrics. Now I have 2 desk surfaces to play on. I also, wanted to be able to have a designated cutting board , and iron station. Here is my cutting place. Here is one of 2 closets I get to use. I made the curtain. I painted the black swirls on the pink fabric. I am soooo excited to be in my new space!!! Big smiles, Big smiles!!!!! Thanks for coming to see my new space. I worked in it last night for the first time...sigh!! It was wonderful. I wished everyone lived closer...I would love to have everyone come play and make treasures!!! Many Hugs to you all !!! Oh wow, I wanna come play!!! You have every right to be proud It is outstanding! A big room would be so nice, and you have yours orgaanized so well! Yes, a well deserved "Happy Creating" to you! Oh my goodness...the space is wonderful! You can definitely be creative with such a fantastic studio! Do you think you have enough fabric? Giggle...and the best pic was of that smile ...you are so happy, your smile is contagious...I am smiling in Nova Scotia...yay you! Thumbs up! A very nice sewing studio. Fantastic! !A big job, any wonder you have a big smile! So organised and the double big doors letting in the light and outside in while you are crafting. Your studio looks amazing. GORGEOUS!!!!!! Next time I am out west, we will have a sew-in! Congrats! Great job! It looks wonderful. So organized and tidy. How fun to have so much room to work in. And I love that you named your Bernina sewing machines! Your room is amazing! Can't wait to see the amazing things that come out of that room. The room is fabulous....Have fun in there. Wow, I am sew jealous. I hope to be as organized as you some day. I'm ashamed to admit that I'm every shade of green with envy! Holy cow!! What a room!! awesome! I love those cubby shelves! Wow!! I just love your room and all the space! Everything is so bright and cheery and all the beanie bears and such add a cozy feel! I just moved back into my room.....but I'd gladly move into yours! what a wonderful space - you're already so creative I'm really looking forward to seeing what is produced from the new studio - enjoy! Wow, that looks amazing. I'm drooling here! 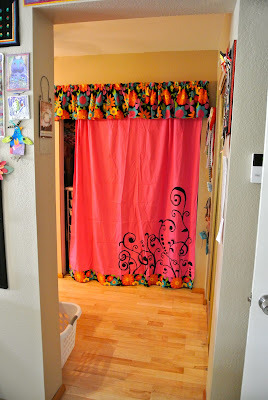 Enjoy your new beautiful creative space - Love those curtains! Eso si que es un taller espectacular. I love your space...I need to add some wall shelves/cubby holes to mine so I can display more...and I like the skirts you made to go around the tables. I've toyed with doing that myself. Squeel!!!!! OMG Sandie!!! It's awesome! You must think all that hard work was worth it! I can't wait to come and play!!! Maybe I can pop in and see it tomorrow before the gym!!! Wow! I'm totally amazed! This is so cool. You have just done an awesome job. 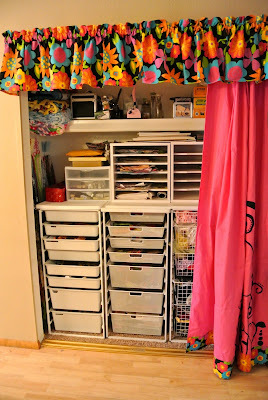 Your room is awesome- would love to have one just like it- I am working on my little craft room and wish it were larger but maybe one day. I Love your room...STUDIO!!!!! When I move I hope I am blessed with a room to set up for friends to come and Play -N- Pray.Keep sharing your gift. I have learned sooooo much from you, Girlfriend!!!!! Congrats on your new space. It's awesome! And big! I wish I could come and play! P.S. 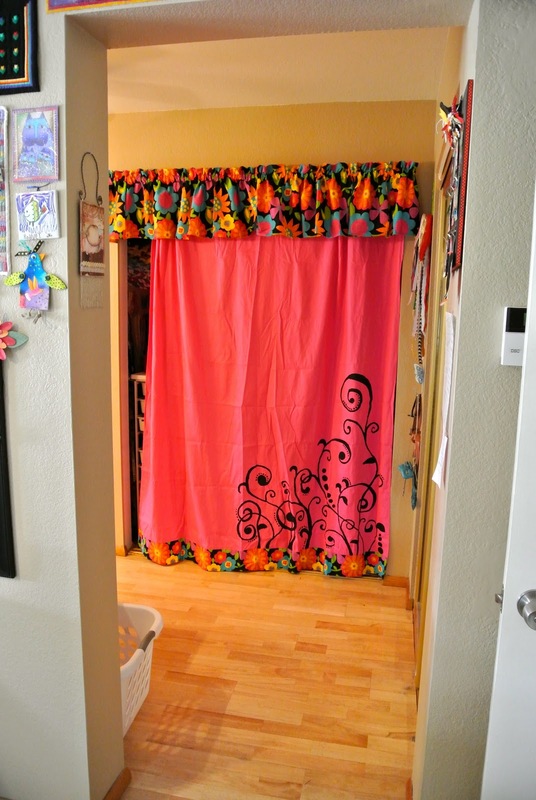 Love the curtain you painted! Oh, loving this Sandy! So many shelves and space! I love your studio, so organized. I am so envious of your lovely space. Congratulations on creating such a beautiful place to work. May you have mamy, many happy hours there..
Congrats on your new space! It is beautifully organized. What an inspiration!